Angel the cat has a severe tail injury and a badly broken pelvis. SCRAPS staff said Angel the cat passed away. Someone shot him with a pellet gun, leading to an infection and a broken pelvis. 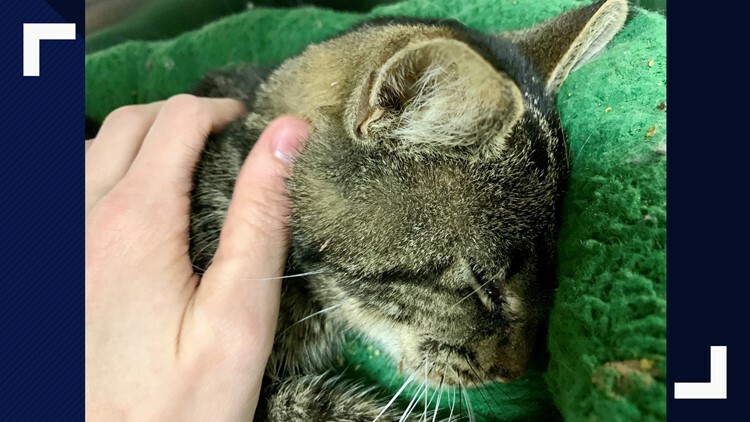 SPOKANE, Wash. — SCRAPS has said that Angel, a cat that came to them with injuries sustained from pellet gun wounds, has died Tuesday. Angel died Tuesday afternoon after showing up to SCRAPS with a "massive infection and a badly broken pelvis" after being shot with a pellet gun, according to a Facebook post. "He was beating the odds, and we wanted so badly to see his body and soul mend," SCRAPS wrote. "Our hearts are broken, but we are so grateful to each of you who have taken the time to read his story and bear witness to him — he was seen and loved." Staff said Angel has a severe tail injury that caused the massive infection, along with a badly broken pelvis. “A human intentionally broke his body and, devastatingly, also broke his spirit,” SCRAPS wrote on Facebook. Angel buried his head and avoided eye contact, but remained gentle and accepted his medications as care was provided, staff said. SCRAPS also credited Dr. Hamilton of Valley Veterinary Clinic with prolonging Angel’s life after he performed emergency surgery on the cat.